Unlike most of its other packaging, which is very flowery, colourful and cute, Karadium has designed their Colour Control Cream more simply and elegantly. The tube is white with black text, and comes with a twist off cap, and a narrow nozzle. Texture-wise, it's similar to almost every other cc cream I've seen. It's a very lightweight, slightly watery, white cream, and if you look closely you can see grayish beads within the formula. It has a very vague floral-like scent, but I'd say it's barely fragranced overalll. 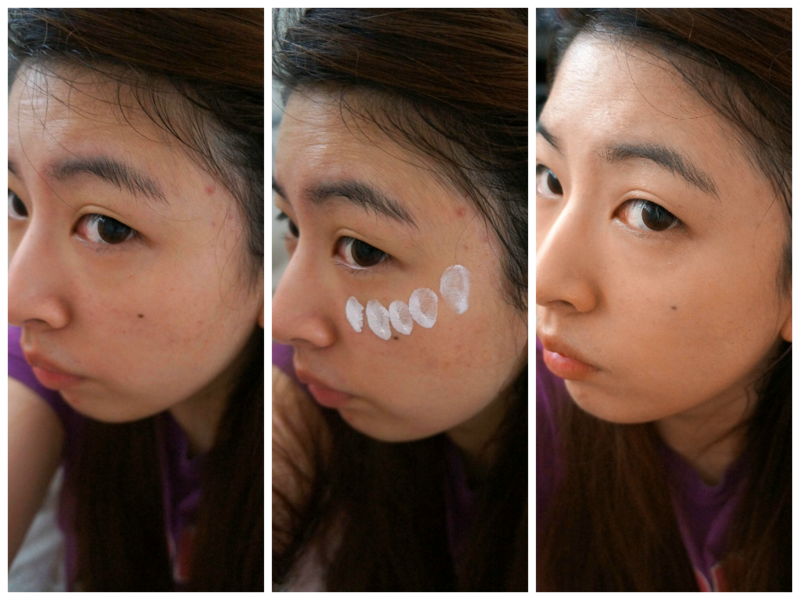 The beads burst when applied, and they have colour adjusting properties that helps the cc cream adjust to the skin tone. From reading reviews, and having tried the Etude CC Cream, I'd learnt that while CC Creams may be lightweight and feel more natural than BB Creams, they also tended to lack good coverage. However, I found myself surprised and impressed with the coverage factor of the Karadium CC Cream. It's almost as good as a bb cream! While it doesn't conceal my acne scars, or all of the redness on my cheeks, it did a quite fantastic job evening out my skin tone overall. I actually have worn only this as my base, out and about - and most of you would know I never go out without my bb cream on! I have also worn this as a base and put my normal bb cream on top for fuller coverage, but I have to say on its own the coverage is really decent, and would be more than adequate for anyone who has decent skin already. Those with quite blemished skin and looking for something high coverage wouldn't be blown away by this, but those with blemished skin looking for something lightweight and natural looking, might like it. And I must mention how natural the finish of the cc cream is. It's slightly matte in finish, but not in a powdery way, but more similar to a skin-like texture way. As in, it practically looks like your actual skin. It also feels super lightweight on the skin, like wearing nothing an all, which I'm a big fan of. The only con I have is related to cc creams in general, and not just targeted at the Karadium CC Cream. To get the most natural effect, the cc cream has to be blended or massaged into the skin, and since my skin is on the dryer side, all that massaging tends to create patchy areas on the driest parts of my face (around the mouth, nose, and apples of my cheeks normally). I think cc creams would work amazingly well on normal to slightly oily skin types, but dryer skin types would have a harder time to get that natural skin-like finish without any patchiness. Overall, I think the Kardadium CC Cream is quite a good product, and I've enjoyed using it. If you're on the hunt for a good cc cream to try, the Karadium one could be a good start. Cosmetic Love should be stocking it soon, so keep an eye out! Don't forget my Hello! Spring Giveaway is ending in about a week - enter here if you haven't yet! I'm really curious about all the Karadium products. They all look really interesting. Thanks for your review! This CC Cream sounds good, this brand Karadium is quite a new for me, haven't try any product from them, I think I would love to try this one, is this CC Cream can match for NC30 skin? I've tried a sample of the TM one - it's a little more hydrating which is nice, but I definitely love my bb creams more! Most cc creams will adapt to skintones - I'd say this one is a good match for NC25 as it's slightly dark on me. NC30 should be fine too, but it might have a more brightening/whitening effect, so careful blending would be good.